Jeff Bezos, the founder and CEO of Amazon, has charged that the National Enquirer attempted to blackmail him by threatening to release lurid photographs of Bezos. In 2017, Amazon removed a controversial book from their website. 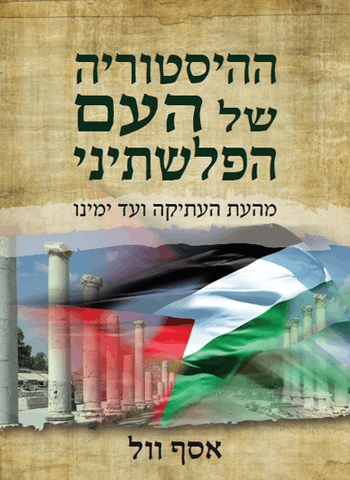 The book, A History of the Palestinian People: From Ancient Times to the Modern Era, was written by Israeli author Assaf A. Voll and was available in Hebrew and English. What was the issue that led Amazon to remove the book from their website? A_History_of_the_Palestinian_People_Hebrew_Cover is licensed under CC BY-SA 4.0. A. 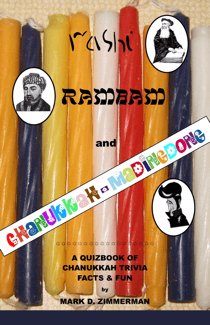 It was discovered that the book was actually written by a Palestinian historian, Tarif Sharabi. Knowing that he could not get his book published by an Israeli publishing company, Sharabi partnered with his friend, Israeli writer Assaf Voll, who submitted the book under his name to Geffen Publishing House, where in fact it was accepted for publication. C. Charges were made that sections of the book had been plagiarized from the book Palestine and the Palestinians: A Social and Political History by Palestinian writers Samih K. Farsoun and Naseer Aruri, pubished in 2006. While Voll denied the claim, a comparison of numerous entries in the two books led many scholars to conclude that Voll had improperly used material from the earlier work. D. There was an outcry from within the Palestinian and greater Arab communities that the book was an illegitimate appropriation of Palestinian history by an Israeli writer. The New England Patriots were the victors against the Los Angeles Rams in Super Bowl LIII, which sports writer Jeff Pearlman (and many others) called “the worst Super Bowl ever.” Wide receiver Julian Edelman, the first Jewish player to win the MVP honor in a Super Bowl, led the Patriots to victory over the Rams, also known as “the wrong team,” following the infamous “non calls” of pass interference and helmet-to-helmet contact in the NFC Championship game, where the New Orleans Saints had the game stolen from them by the incompetence of the officiating crew. 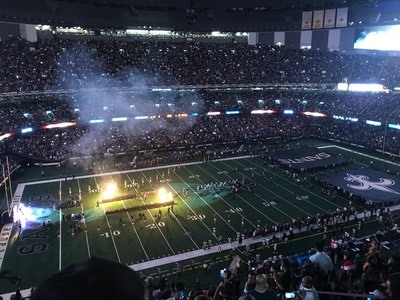 Michael Hurley of CBS Boston Sports said, “This was a missed call that literally took a Super Bowl trip away from the Saints.” Don Van Natta Jr. of ESPN called it the “worst no-call in NFL history.” Former NFL quarterback and 4-time Pro Bowler Boomer Esiason tweeted, “The @Saints got royally SCREWED!” New Orleans is a city which is totally devoted to their football team, and that includes the local Jewish community, about 11,000 strong. What is the name of a Saints fan group within the New Orleans Jewish community? B. Blue and White for Black and Gold. Ann Coulter, the conservative political commentator who is considered a strong influence on President Trump, appeared on Real Time with Bill Maher. She criticized Trump for giving in on the government shut down without getting funding for a wall on the Mexican border, saying “He promised something for 18 months, and he lied about it.” She argued that the wall Israel built to stop suicide bombers is proof that a wall works. In the past, Coulter has made remarks which offended many Jews. What did she say? 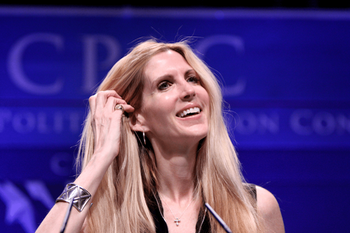 Ann Coulter by Gage Skidmore is licensed under CC BY-SA 2.0. Actress Carol Channing, best known for playing the role of Dolly Levi in Hello Dolly more than 4500 times in her career, died last week at the age of 97. Channing was raised as a Christian Scientist, though she later discovered that her mother was Jewish. She learned Yiddish fluently from her first husband’s grandfather, Sam Cohen. Which of the following details another time she interacted with the Jewish community? 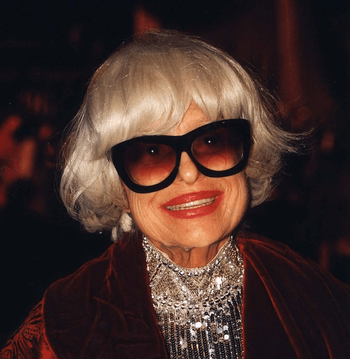 Carol Channing by John Mathew Smith is licensed under CC BY-SA 2.0. A. In 1964, Channing sang a version of Hello Dolly rewritten as Hello Lyndon, which President Lyndon Johnson used on the campaign trail. In fact, this was her second recreation of that song for a politician, as she sang Shalom David for Israeli Prime Minister David Ben-Gurion earlier in 1964, at a celebration in his honor hosted by the United Israel Appeal organization in New York, following Ben-Gurion’s retirement from government at the end of 1963. B. Channing was known for her voice, her big eyes, and platinum blonde hair. Though she performed in her real hair early in her career, over time the constant dying and teasing damaged her hair, and she eventually began wearing a wig. A hair and makeup artist who worked with Channing during Hello Dolly directed her to Claire Grunwald of Claire Accuhair in Midwood, Brooklyn. Almost all of Claire’s client base was Orthodox women who must wear wigs in public to maintain modesty. Grunwald and Channing became very good friends, with Channing attending Passover seders and other holiday celebrations at Claire’s apartment. C. Carol Channing had one son, with her second husband Alex Carson. That son, named Channing, was not raised Jewish. However, he learned that his mother was in fact Jewish (by virtue of the fact that her mother, Adelaide Glaser was Jewish), and that therefore he too was Jewish. He had many Jewish friends in school, and eventually decided he wanted to have a bar mitzvah. Channing respected his wishes, and her son had a bar mitzvah at Central Synagogue in New York, followed by a party at Sardi’s Restaurant. E. Channing’s first lead role on Broadway was in the musical Gentlemen Prefer Blondes, where she sang the song Diamonds Are A Girl’s Best Friend. To promote the show, the producers set up a stage on 47th Street in the heart of New York’s Diamond District, and Channing would appear daily and sing that song. Chassidim who worked in many of the diamond businesses there began disrupting the events saying that it was improper for religious men to hear a woman sing. Not wanting to end the show promotion, the producers convinced the Chassidim that this was actually a Carol Channing impersonator in drag, so the prohibition against hearing a woman sing did not apply. Satisfied, the Chassidim instead joined in, dancing the hora as “she” sang. 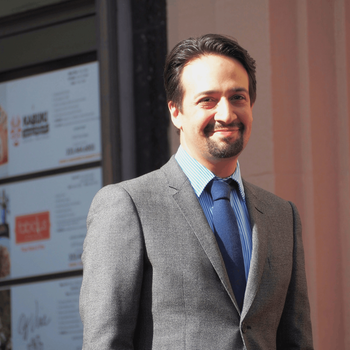 Lin-Manuel Miranda, the playwright and composer who wrote the mega-hit Broadway show Hamilton, and who is currently starring in the movie, Mary Poppins Returns, just returned to the role of Alexander Hamilton in a production of the show in Puerto Rico. Miranda staged the show there to raise funds and bring attention to the island from which his family came, as they still struggle to recover from the devastating aftermath of Hurricane Maria in 2017. When Miranda married Vanessa Nadal in 2010, he surprised her and the wedding guests at the reception with a performance of L'Chaim, from Fiddler on the Roof. What previous musical Jewish connection does Miranda have? Lin-Manuel Miranda Walk of Fame ceremony by Luke Harold. B. In 2002, shortly after graduating from college, Miranda participated in the BMI Lehman Engel Musical Theatre Workshop, the premier training program for musical theater composers. He partnered with another participant who had begun writing a musical version of the Biblical story of Moses set in modern times. Among Miranda’s contributions was the song Ten Cool Commandments, which Miranda later used as the basis for the song Ten Duel Commandments in Hamilton. C. Growing up in New York City, Miranda attended Hunter College High School from 7th through 12th grade, where many of his friends were Jewish. In 1993, when he was thirteen years old, he wrote and performed a song at a friend’s bar mitzvah party called Today You’re A Man/Today You’re My Man. D. At Wesleyan College, Miranda was a member of the Jewish a capella group The Mazeltones. Their repertoire included the song Hinei Ba Hashalom, where Miranda sang the lead, even pronouncing the guttural Hebrew “CH” sound perfectly. Following the election of a Democratic-majority House of Representatives, Congresswoman Nancy Pelosi has just been elected as Speaker of the House. Pelosi, a strong supporter of Israel and the Jewish community, is the only woman to have ever held that post, and the first person in sixty years to regain that position after her party had lost their majority status. What did Pelosi do once when speaking to a Jewish audience which impressed those who were listening to her? A. Shortly after the neo-Nazi march in Charlottesville in 2017, Pelosi was addressing an audience at Temple Emanu-El, the large Reform synagogue on Fifth Avenue in New York, when a protestor in the back of the room stood and shouted, “Jews will not replace us.” As the audience reacted with trepidation while security guards removed the protestor, Pelosi began singing the Star Spangled Banner. The entire audience stood and joined in, after which Pelosi received a huge round of applause. B. 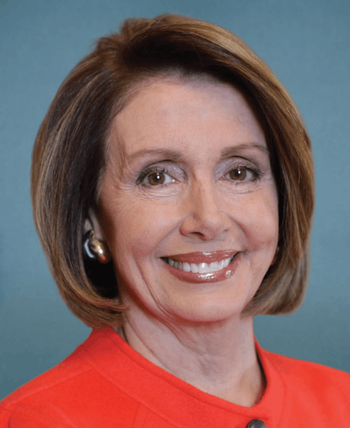 In October of 2018, Pelosi was addressing an audience at the Jewish Federations of North America’s General Assembly convention, which met in Tel Aviv for the first time. An alarm went off in the room, and attendees were advised to shelter in place while officials determined whether there was a serious threat. One security official approached Pelosi on the speaker’s platform to lead her through a secure back exit, but Pelosi insisted on remaining in the room with attendees, saying that she deserved no better treatment than any of the convention delegates. C. Pelosi was addressing an AIPAC meeting in San Franciso a few weeks after the September 11 terrorist attacks, when an alarm went off in the building, causing much consternation in the room. As people reacted, in some cases, heading for the exits, Pelosi began reciting the words of the Israeli national anthem, Hatikva, which brought much calm and comfort to those assembled. Israeli writer and peace advocate Amos Oz died last week at the age of 79. Oz wrote novels, essays, short stories, children’s books, and more. Among his most well-known works were the novels Elsewhere, Perhaps and My Michael. His memoir A Tale of Love and Darkness focused on the suicide of his mother when he was 12 years old, and was later turned into a movie directed by and starring Natalie Portman. How did Oz describe his writing? 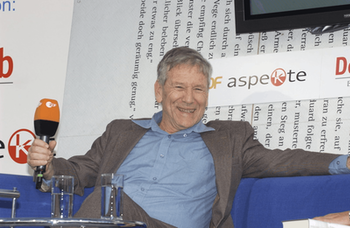 Amos Oz auf dem Blauen Sofa by Das blaue Sofa / Club Bertelsmann is licensed under CC BY 2.0. The United States Senate passed a measure to put an end to United States support of Saudi Arabia’s military intervention in Yemen. Only 50 Jews remain in Yemen, following a more than 2000 year history. Almost the entire Jewish community fled the country in 1949 and 1950, immigrating to Israel in what was known as Operation Magic Carpet. Which of the following is true regarding almost 50,000 Yemenite Jews who went to Israel at that time? Costumes, characters, etc. 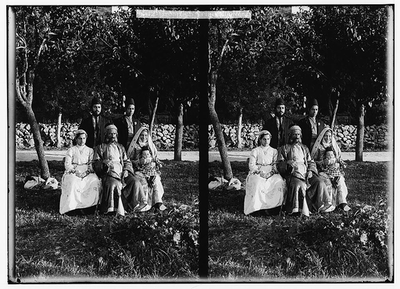 Group of Yemenite Jews from the United States Library of Congress's Prints and Photographs division. A. The fleeing Yemenite Jews flew to Israel on Alaska Airlines. The 48 seats on the planes were removed so that more than 100 people could fit on a flight. This still required more than 430 flights over the course of 16 months to bring all the Yemenite Jews to Israel. B. Because none of the fleeing Yemenite Jews had ever flown, or even seen a plane, there was great fear among the assembled regarding the boarding of this huge, strange vehicle for the first flight out of Yemen. While community leaders and Israeli officials were discussing how to best convince the reluctant people to begin boarding, a young boy began climbing the ladder. The community took this as a sign from God, as the boy’s name was Nahshon Dahari, which was reminiscent of Nahshon, the leader of the tribe of Judah who was the first Israelite to set foot into the water at the Exodus crossing of the Red Sea. C. Of the more than 400 flights from Yemen to Israel, the very first flight had the fewest number of people on it, as the community insisted that their Torah scrolls be evacuated even before the people. 373 Torah scrolls were on that initial flight, the oldest of which dated to the 12th century. D. At first, the Yemenite Jews refused to board the airplane, something they had never seen before, based on their interpretation of the Torah. The Book of Genesis, chapter 1 verses 7-8 reads: “And God made the expanse and it separated between the water that was below the expanse and the water that was above the expanse, and it was so. And God called the expanse Heaven, and it was evening, and it was morning, a second day.” They interpreted this to mean that the sky is the heavenly realm of God and therefore they were not willing to get onto a plane that would bring them up into that realm. Ultimately, however, the Chief Rabbi of Yemen convinced them that the superseding law was that which stated that anything could be done to save a life. E. In an effort to avoid missile fire from hostile Arab nations attempting to stop the operation, pilots of the airplanes bringing the Jews to Israel developed a maneuver wherein they would jog the plane slightly to the left, back to the right and then ultimately make a left turn, or alternately jog the plane slightly to the right, back to the left, and then make a right turn. This diversionary tactic, which allowed hundreds of flights to safely reach Israel, was adapted by the Yemenite Jews into dance moves which have become known as Yemenite left and Yemenite right in traditional Israeli dancing. 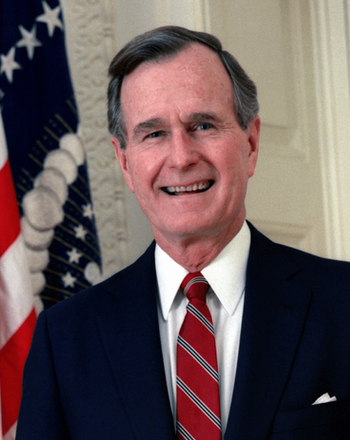 President George H. W. Bush passed away last week at the age of 94. Bush was generally considered a friend to American Jews and Israel. But at least once in his life, he said something that prompted blow back from members of the Jewish community. What did he say? A. Before Bush entered politics, he was an entrepreneur in the oil business in Texas, and in 1954 he became president of the Zapata Offshore Company in Midland, Texas. When Egypt blocked the Suez Canal in 1956, leading to the Second Arab-Israeli War, Bush spoke out against the Israelis, claiming that they and their French and British coalition partners were causing a major disruption in international oil markets, hurting Bush’s company as well. Members of the Jewish community in Houston reached out to Texas governor Allan Shivers, who contacted his friend George Bush and alerted him to the distress he had caused within the Jewish community. Bush apologized, and often referenced that incident as one which enlightened him to the issues facing Israel, something he did not have much knowledge about previously. B. In 1991, Bush opposed a plan to provide $10 million in loan guarantees to Israel in support of the resettlement of the large number of Soviet Jews who were arriving in Israel. There was a strong effort in the Jewish community to get Bush to go along with the plan, prompting him to say that he was just “one lonely guy” up against “a thousand lobbyists on the Hill.” Bush later apologized for the remark, which was seen as suggesting that Jews had too much power in Washington, DC. C. When President Bush was putting together a coalition to fight against Iraq following Saddam Hussein’s invasion of Kuwait, there was great discussion as to what role Israel might play. Prime Minister Yitzhak Shamir was anxious to see Saddam Hussein defeated, as he feared that otherwise, Iraq would be emboldened to attack Israel. Hussein had spoken of wanting revenge against Israel since the 1981 bombing by Israel of the Iraqi nuclear facility. But Bush was concerned that an Israeli presence in the coalition would restrict America’s ability to align with other Arab countries against Iraq. At one point, in frustration, Bush said during a White House strategy session that “we have to find to way to keep that Jewish fellow quiet.” When word got out of Bush’s reference to Shamir, he received great criticism from within the Jewish community, leading him to apologize to Shamir for his indiscretion. D. Following the Gulf War in 1991, the Bush administration began to focus on the Arab-Israeli conflict, feeling that the time was ripe for a resolution, following the defeat of Saddam Hussein and the freeing of Kuwait by the American-led coalition. Israeli Prime Minister Yitzhak Shamir was reluctant to enter negotiations, and at one point Bush said, “We will always stand by our Israeli friends. But that does not mean that we will stand by blindly. I call on Prime Minister Shamir to join in our efforts, so that we can continue to stand side by side.” There was a huge outcry from the American Jewish community and Congress who felt that this was unduly harsh and threatening to the Israelis, leading Bush to publicly apologize to Shamir. Ultimately, they did move forward together with the Madrid Conference, a forerunner of the Oslo Accords of 1993. President Trump is hosting the official White House Chanukkah party on Thursday, a tradition started by President George W. Bush and continued by President Barack Obama. 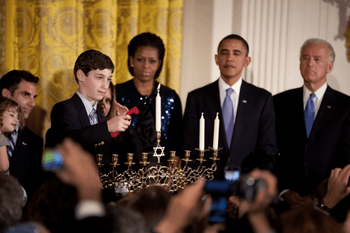 The first president to actually light a menorah in the White House was Bill Clinton. Though he did not host an official party, Clinton did invite a dozen schoolchildren to the White House in 1993 for a small candle lighting ceremony. What did a 6-year-old girl named Ilana do at that event? A. She sang the Chanukkah blessings. B. She wandered off into the White House, eventually coming upon Chelsea Clinton in her bedroom. Chelsea and the girl played games and Chelsea read her a book until the Secret Service came in looking for the lost girl. C. She taught President Clinton how to play the dreidel game. D. She got too close to the candles, causing her ponytail to catch fire. President Clinton snuffed out the fire with his hands. E. She got too close to President Clinton and he caught fire. The Secret Service snuffed out Ilana with their hands.